Her approach was dramatic and effective: Simply painting a part of the street to make it into a plaza or bus lane not only made the street safer, but it also lessened congestion and increased foot traffic, which improved the bottom line of businesses. Real-life experience confirmed that if you know how to read the street, you can make it function better by not totally reconstructing it but by reallocating the space that’s already there. Breaking the street into its component parts, Streetfight demonstrates, with step-by-step visuals, how to rewrite the underlying ‘source code’ of a street, with pointers on how to add protected bike paths, improve crosswalk space, and provide visual cues to reduce speeding. 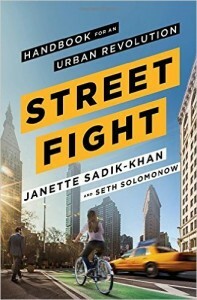 Achieving such a radical overhaul wasn’t easy, and Streetfight pulls back the curtain on the battles Sadik-Khan won to make her approach work. She includes examples of how this new way to read the streets has already made its way around the world, from pocket parks in Mexico City and Los Angeles to more pedestrian-friendly streets in Auckland and Buenos Aires, and innovative bike-lane designs and plazas in Austin, Indianapolis, and San Francisco. Many are inspired by the changes taking place in New York City and are based on the same techniques.